At the global level, the Art Market was in better shape in H1 2017, ending two consecutive years of slowdown. According to thierry Ehrmann, founder and CEO of Artprice, Since 2000, the art market has been functioning with outstanding maturity, resisting the NASDAQ crisis, the nine-eleven attacks, the second intervention in Iraq and of course the unprecedented financial and economic crisis that began in 2007. It has also resisted a significant increase in global geopolitical tensions and the emergence of a negative interest rate environment that hurts savings. During the past 17 years, the Art Market has shown its capacity to adjust to conditions, thus avoiding the kind of meltdowns seen in the financial sphere. It has therefore played a vital “shelter asset” role, without inflating into a speculative bubble. As for China, after a large number of records, the country’s art market has posted a healthy correction, belying the recurring fantasy of a speculative bubble. On the downside, Germany’s market shrinkage of -6% was marginal in view of its global ranking (6th) and its transaction volume (1.5% of global turnover). However, Spain has posted a dramatic -30% fall with just $7 million in turnover in 6 months, leaving the country 28th in the global marketplace ranking behind Poland ($18 million), Turkey ($14 million) and Israel ($8.5 million). In the soft-power duel between the People’s Republic of China and the United States, the balance has never been so close, with both countries posting almost equal transaction volumes and turnover figures. In the USA, 38,000 Fine Art lots sold for a total of $2.2 billion over the six month period whereas in China, 37,900 Fine Art lots sold, generating a total of $2 billion. Every year since the Chinese art market boom (circa. 2008 – H2 2013), one of the two superpowers has taken a significant lead over the other. But for H1 2017, the difference is negligible. This unprecedented new parity is however the fruit of two diametrically opposed developments on each side of the Pacific. While auction turnover climbed 28% in the United States, China suffered a 12% variation, as confirmed by our Chinese State partner, Art Market Monitor of Artron (AMMA). 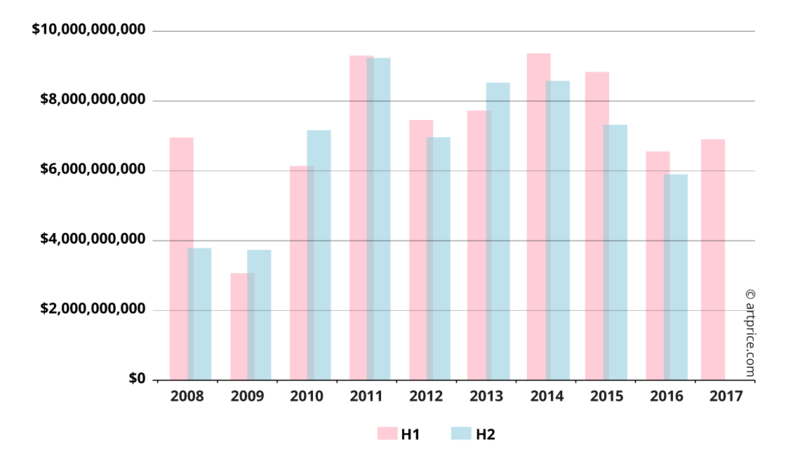 The rivalry between the two superpowers will be interesting to follow in H2 2017, since China usually generates a higher turnover in the second half of the year (confirmed over the past eight years) whereas the Western market usually posts a lower level of activity in H2. 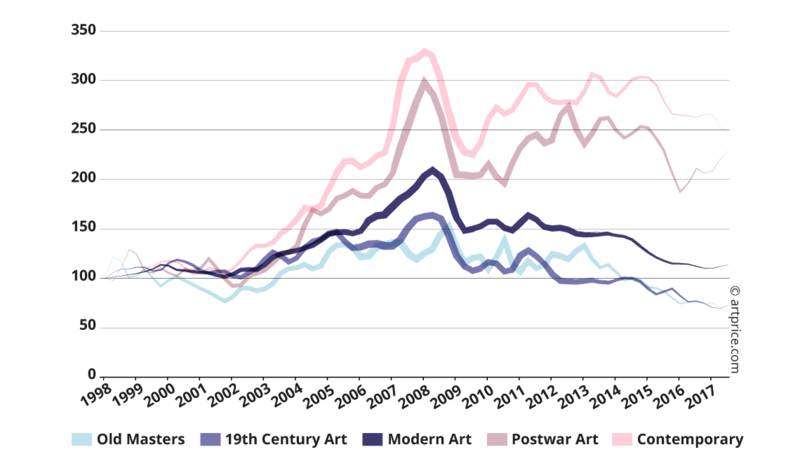 Sales of Contemporary and Post-War Art appear to have closed out the period of adjustment on the Western market that began in H2 2015. This adjustment was essentially triggered by an inevitable squeeze on revenues caused by the auction companies’ increasing difficulty in bringing together top quality artworks in the Modern and earlier artistic periods. Fortunately, activity in recent months suggests a new era of prosperity has begun, with the most significant signal coming from the sale of Jean-Michel Basquiat’s Untitled (1982). The $110.5 million paid for this Contemporary canvas illustrates a profound change in market attitudes: collectors are now perfectly willing to pay equivalent sums for Contemporary and historical (pre-Contemporary) masterpieces alike. This new dynamic is the result of a gradual transformation of the Art Market. Since 2000, collectors have shown a growing interest in works created during the second half of the 20th century and the early 21st century. So, whereas Post-War and Contemporary Art accounted for 8% and 3% of global auction turnover 17 years ago, they now represent 21% and 15%. The concentration of the high-end Art Market in New York has allowed the world’s most powerful collectors to compete in one same and unique marketplace. The new owner of Jean-Michel BASQUIAT’s masterpiece, the Japanese collector, Yusaku Maezawa (aged 41), acquired the work for a sum, hitherto, reserved for Modern and Post-War masterpieces. At $110.5 million, Untitled (1982) is the 6th most expensive artwork ever sold at auction and effectively promotes the New York graffiti artist (deceased of a drug overdose at the age of 27) into the Pantheon of art history’s all-time giants… alongside Pablo Picasso, Amadeo Modigliani, Alberto Giacometti, Francis Bacon and Edvard Munch… the only artists to have ever sold above the $110 million threshold. The 12% drop in China’s secondary Fine Art Market turnover has been caused by a 16% contraction in the number of lots offered rather than by a price weakness. This contraction, currently visible across most of the country (Beijing, Nanjing, Hangzhou and Hong Kong), suggests a nationwide restructuring of the Chinese Art Market. That said, the island of Taiwan posted an outstanding performance, mainly thanks to San Yu’s Vase of Chrysanthemums with red Ground which sold for $9.4 million on 4 June 2017, at Ravenel International. This was an important new record for Taiwan, approaching the critical $10 million threshold, and it boosted Taiwanese art auction turnover by 43%. Like the United States in 2016, and the United Kingdom in 2014, China’s Art Market is experiencing a period of restructuring that has necessarily involved a reduction in transaction volumes. However, the stability of the global Art Market’s second power has not been compromised. Several indicators suggest that the Chinese Art Market remains relatively stable overall. Firstly, the prices of its major Contemporary signatures (usually highly sensitive to market corrections) are continuing to rise. The recent sale of Zeng Fanzhi’s, Mask Series 1996 No. 6 (面具系列1996No.6) (1996) is a good example: purchased at Christie’s Beijing in 2008, for $9.6 million (RMB 75 million), it sold at Poly Auction in the same city on 3 April 2017, for $13.5 million (RMB 105 million), generating a capital gain for the seller of +40% in 9 years. Another even stronger indication of the market’s stability comes from its unsold rate which posted a significant improvement in the first half of 2017. The Chinese Art Market had seen a dangerous increase in unsold works over the past two years, reaching 70% in H2 2016. It has now fallen back to the more stable level of 54%. This is the same unsold rate the Chinese Art Market generated in 2013 and 2014, at its pinnacle. Besides the new record for Jean-Michel BASQUIAT, the other big news on the global Art Market earlier this year is undoubtedly the double new record for Wassily KANDINSKY at Sotheby’s London on 21 June. First, a medium-size canvas dated 1909, depicting Murnau reached $26.8 million; then a large abstract painting dated 1913, Bild mit weissenlinien, fetched $42.3 million. Other major artists from the first half of the 20th century also reached new heights. A sculpture by Constantin BRANCUSI, The Sleeping Muse (1913), and an expressionist masterpiece by Max BECKMANN both elicited very strong bidding. In general, however, Contemporary Art is the most exciting segment of the market for collectors. This reality is clearly illustrated by the overall price evolution for the different artistic periods. The price indices – calculated by Artprice based on all Fine Art auction results worldwide – provide a unique and entirely objective insight into the evolution of the Art Market. The figures clearly show that over the last two years, only the Contemporary Art sector (artists born after 1945) has posted price growth. While Modern and earlier periods have posted stable price indices since the recession initiated by the subprime crisis, the Post-War period is, in turn, finding it increasingly difficult to maintain the growth pace. Its stars – Andy WARHOL, Cy TWOMBLY, Roy LICHTENSTEIN and Gerhard RICHTER – are becoming increasingly rare on the secondary market. This reflects the fact that the “museum industry” (an economic concept developed by Artprice in the early 2000s) is mercilessly pursuing its acquisition of the market’s best works. 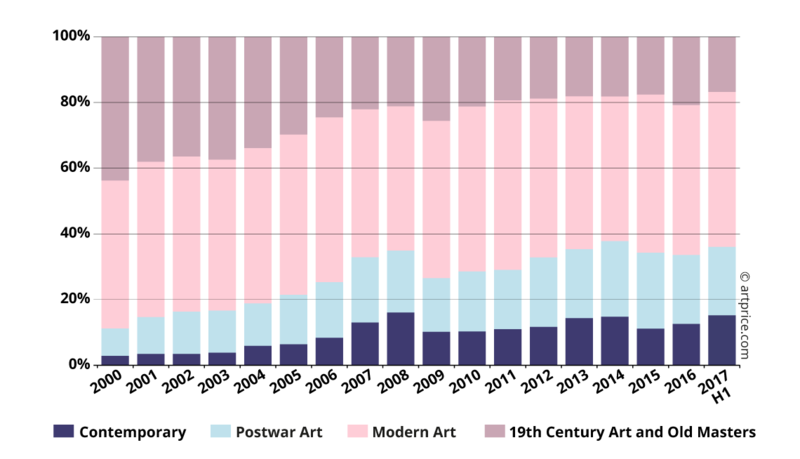 Recall that more museums opened between 2000 and 2014, than during the entire 20th century. Similarly, Artprice confirms that as in 2016, another 700 new museums with ‘international art’ profiles will open in 2017 around the world, thus consolidating the structure of the global museum economy. The new era of prosperity that the art market has entered is, for the first time in its history, driven by Contemporary Art. This represents a historic development in art history and an undeniable indicator of Art Market confidence in living artists. The current power of the Contemporary Art Market (formerly the weakest segment of the market) illustrates the overall solidity of today’s Art Market as a whole… a solidity that adds security and reassurance for newcomers to the market. More than ever, the Art Market is proving its role as a liquid and efficient market, offering extremely attractive returns, particularly in an environment, where central banks are pursuing negative interest rates that are really catastrophic for savers.